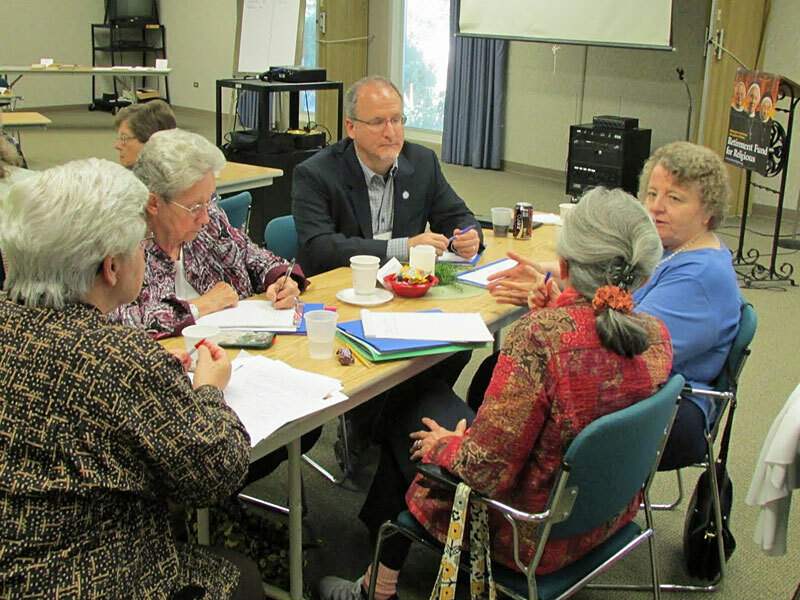 Recent workshop helps religious communities identify and address retirement-funding challenges. Recently, the National Religious Retirement Office (NRRO) held a planning workshop at the Bergamo Center in Dayton, Ohio. Representatives from five religious communities attended the event, which the NRRO offers three times a year. The workshop is one of the key steps in Planning and Implementation Assistance, a comprehensive program to provide financial and consultative assistance to religious communities that are significantly underfunded for retirement. As part of this process, the major superior, treasurer, and retirement director of each participating religious community are paired with two NRRO-trained volunteer consultants. Consultants are experts in the fields of financial planning, eldercare, and community leadership. The planning workshop provides a concentrated opportunity for participants and consultants to identify the most pressing retirement challenges and develop preliminary plans to address them. The workshop also includes presentations on the financial and care-delivery aspects of retirement planning as well as information on additional resources available to assist communities in their efforts. Following the workshop, participants will spend 12 to 18 months gathering data to determine both their long-term needs and the viability of the proposed solutions. Funding is available to underwrite needed research and analysis, such as feasibility studies and financial audits. Guidance from the volunteer consultants and monthly status calls help to keep the planning on track. Having gained a better understanding of current and future needs, the planning team is then more prepared to develop long-range strategies for reducing retirement-funding shortfalls. Implementation Assistance offers financial support to help put the identified solution into action. Read more about recent Planning and Implementation Assistance success stories here. “Thanks so much! The whole experience was fabulous, and we are very grateful,” writes Sister Vincent Marie Finnegan, a member of the Carmelite Sisters of the Most Sacred Heart from Alhambra, California. 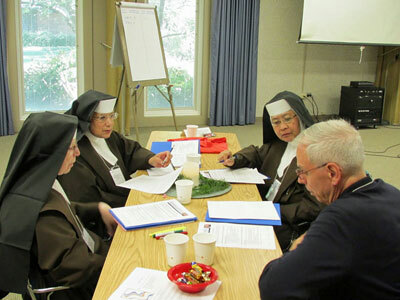 Pictured (clockwise from left): Sister Vincent Marie Finnegan, OCD; Mother Judith Zuniga, OCD; Sister Janelle Necesario, OCD, and NRRO Consultant Brother Stephen Glodek, SM.